Now that I am in the third trimester of my pregnancy (yay! ), I can feel the nesting instincts kicking in stronger than ever. 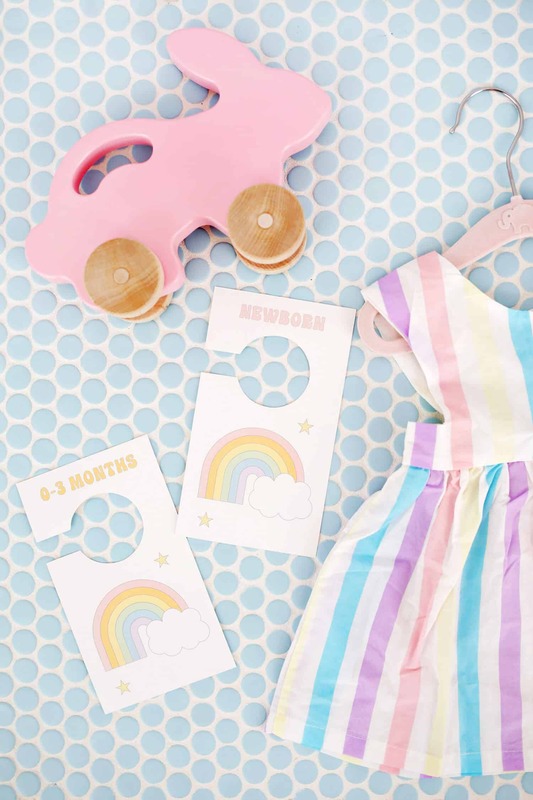 So far most of those instincts have been directed towards cleaning, organizing, and spending hours and hours online looking up baby-related items, but I also wanted to make sure that I made a few items for our baby’s nursery as well. Since we will all be “getting to know each other” for a while after she finally gets here, I thought it would be a sweet idea to make her a little photo holder that introduces her to all the members of her new family. I have lots of animal planters, bookends, and figurines around the house, so using a cute wooden animal as the base of the holder seemed like a good way to continue the theme into the nursery as well. I partnered with our friends at Canon USA on this project, and the first thing you’ll need to do is to prepare your photos for printing. Depending on the size of animal you have, you’ll probably want to size them smaller or larger to fit the scale, so you can even cut out pieces of paper to a size that looks right, and then measure how big those papers are. Print your photos onto photo paper, and then cut out each photo. For this step I used my new Canon PIXMA TS8020! This new size is more compact, so it fits great in my office space but still produces top quality prints. 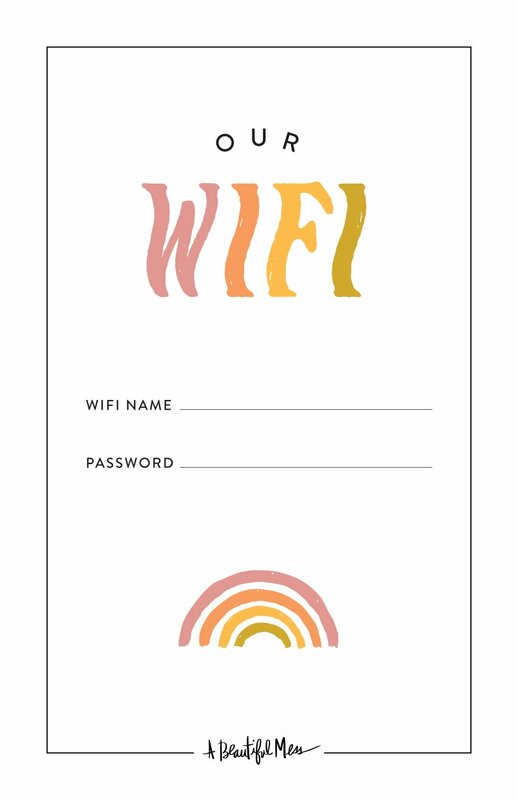 Plus it comes in 4 different colors and can even print 5×5 squares!! 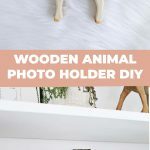 Decide how many holes you want (so how many photo holder sticks you want to come out of your animal) and where you want the holes to be placed. Use a marker or pen to mark the spots for drilling. You can also put painter’s tape or scotch tape on the animal and make your marks on that if you want to eyeball the placement first without marking the actual animal. Use a drill with a drill bit the size of your wire to make each hole (about a 1/2″ deep hole will do). Put a drop of super glue down into each hole and cut sections of wire that are 1-2″ longer than you want their final height to be. Insert your wire sections into each hole. Straighten out your wires and curl the top 1-2″ of each wire around a pen or pencil to create a loop of several layers. Use your wire cutters to cut any excess length if needed and make any wire adjustments with your needle nose pliers. 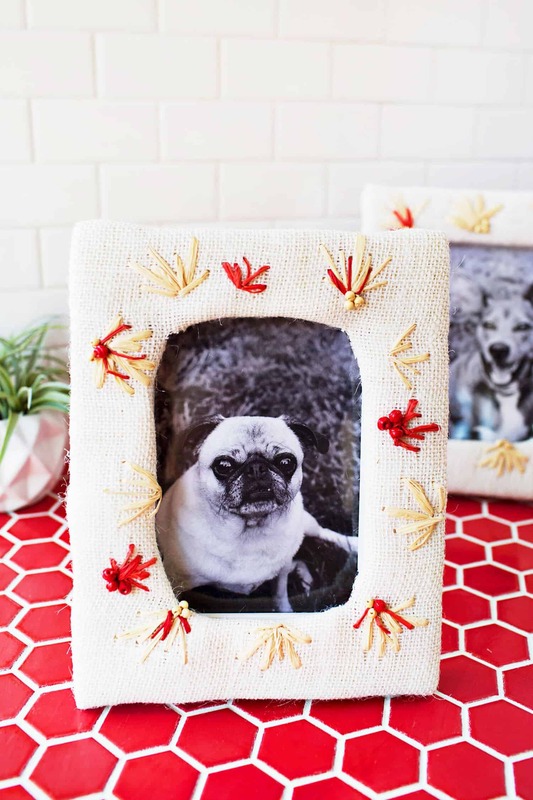 Slip your photos in between the loop layers of each wire, and you’re ready to display your new photo holder! Credits//Author and Photography: Laura Gummerman. Photos edited with the New A Beautiful Mess Actions. This is so cute!!! I immediately thought of about 5 people who I could make this for! I did notice he’s missing a cute little tail, I wonder if you could make a pink or metallic or otherwise fabulously glittery tail out of thread/fibers/beads, cap it with wire-wrapping, then attach it the same way you did the wire? He looks plenty regal and pretty as he is now, though, I’m just always looking for glitzification opportunities! Congrats on Baby! Best wishes as you nest and prep to meet her sweet self! Omg!! Its a unicorn!! So cute! I DIE. Super cute idea. I don’t know what your theme is, but growth charts are so fun for kiddos to see how big they get. I wonder if you could do a unicorn and use its horn as the ruler? Anyway… hang in there girl. 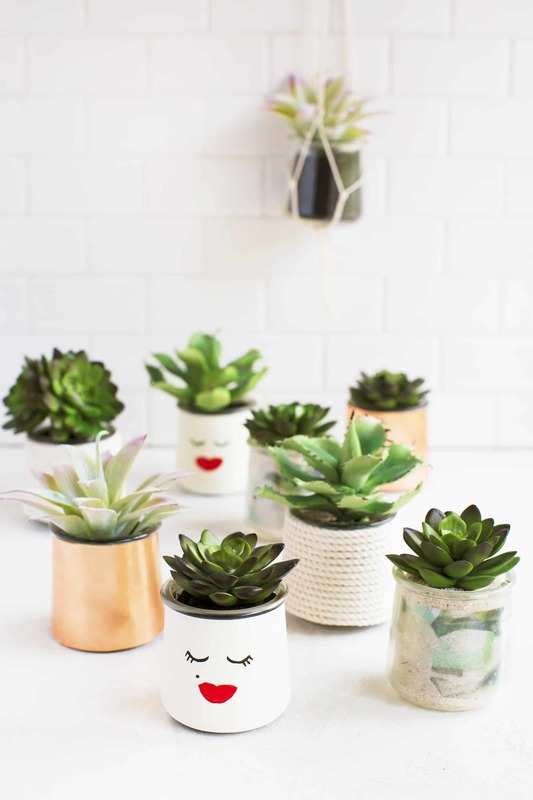 This is such a nice and easy diy! This is a super cute way to display photos, would make a nice gift too. Loved that you featured a unicorn! I am personally terrified of horses (although unicorns are another story), but this has sparked so many ideas of things I could turn into photo holders! The possibilities are basically endless! I just want to stock up on cute figurines + knickknacks and turn them into awesome photo holders now ? Wonderful art.. it is so good for kids. Thanks for sharing it. oh my gosh that’s such a good idea, a lovely glittery mane and tail sound great! 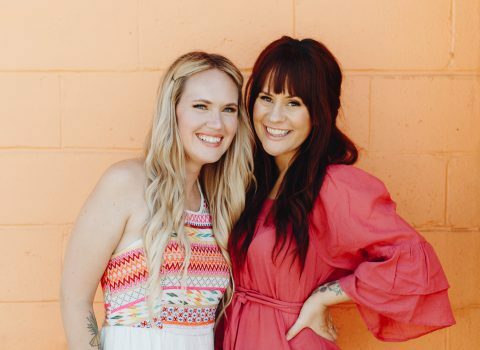 Really want to give this one a try, great idea Laura – can’t wait to see your nursery tour! That’s so adorable! It’s so cute and fun as well! Laura when is your baby shower? I cannot wait to see all the PRETTY! We hope you will share. What a cute idea! I immediately thought about a peacock, whose tail feathers are turned into the photo holders. I adore how easy this is! Just my kind of weekend project! This little guy is so cute. Thanks for the share. I am a strong believer that it is the small pieces like this that make the biggest impact over time. They also provide a space for you to reflect your personality. Oh my this is just TOO cute! I need to include it in my round up of best unicorn DIYs!!! Omg. This is so smart. I made something like this once, using crocodile clips. I hated it in the end because they punched holes into my photos. Should have thought of this. Pffft silly. Where is that gold and white planter from? Looks like a Modernica design? !